Medical treatises and cosmetic handbooks offered advice on how to best care for the teeth. 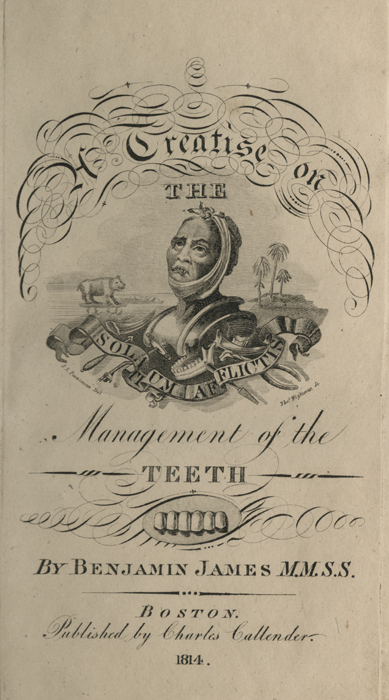 The title page Benjamin James’ Treatise on the Management of the Teeth [pictured left] shows a man clearly in agony, with a bandage tied around his possibly broken jaw, and broken and irregular teeth protruding from his bloody mouth. This horrific image unfortunately is indicative of the state of dentistry in the nineteenth century. 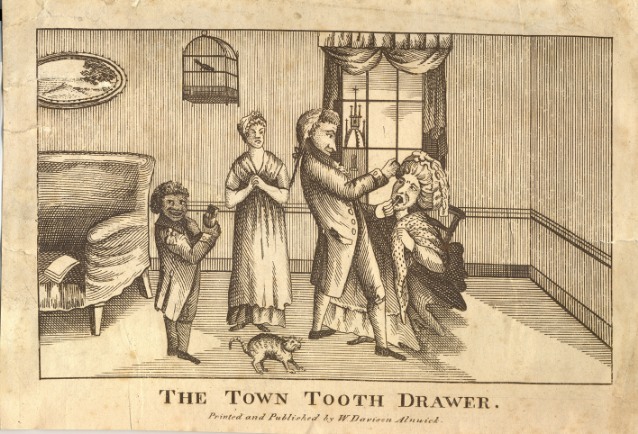 The target audience of medical treatises were often dental surgeons. Those seeking to learn more about their teeth would likely be confused by the conflicting advice offered by the professionals. The image on James’ title page includes a number of dental instruments with a banner, on which is written a Latin motto that translates “relief to the distressed.” The instruments include a key for removing teeth, hand drill, file, pliers, and a set of dentures. Although dental treatises were numerous, they rarely discussed the health of the mouth; rather their focus was personal appearance.